On a sunday in the month of august, our little painting class went on a trip to learn what painting ‘en plein air‘ is all about. Luckily, the area where I live has a lot of nature to offer. 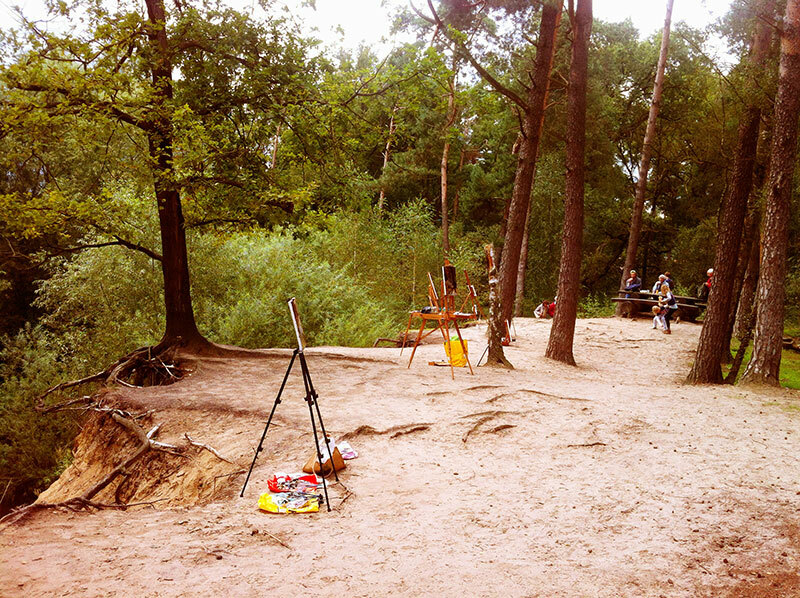 Bryan – a professional painter from the city of Enschede – took us to ‘Het Lutterzand‘. This nature park is quite unique, mainly because of its creeks with sandy shores. The color of the sand you find at Lutterzand, is remarkable warm and light. A perfect place to paint. What to take with you when painting plein air? That’s quite simple. Of course, you’ll have to bring your regular painting equipment: brushes, oil paint (ultramine blue, cobalt blue, cadmium red, cadmium yellow, yellow ocher, burnt sienna, rose madder or kraplak and titanium white), palette knives, white spirit in a closed jar, one or two fully prepared pieces of canvas (I used linen with a layer of gesso, 30×40 centimeters), and some pieces of paper or old cloth (for wiping off your brushes). Furthermore, I recommend to bring disposable paper palette with you, a few plastic bags for trash, and finally – very important – a portable easel. Take a look at the image on the right side of this page to see which easel I used. It’s probably not the most luxurious one around, but because of its adjustable three-legged frame it’s very ‘transportable’. Oh, and also very important: before you make a ‘painting plein air trip’, be sure to give your pieces of linen a first layer of paint at home. This can be a mixture of yellow ocher, burnt sienna and just a little bit of ultramarine blue. It should be a warm, yellowish or reddish mixture, thinly applied with a large brush and some white spirit. Working on a painting outside, means expecting the unexpected. When we went outside to make some landscape paintings with our class, the day started quite sunny. But after painting for an hour or two, the rain came. We had to run with our easels, paintings and equipment to a nearby restaurant; it must have been a funny sight. When you encounter some rain during your plein air session, don’t worry too much; oil paint and water aren’t the biggest enemies (acrylic paint and water are!). Besides the possibility of rain, you’ll have to deal with the ever changing daylight. One cloud can change what you see entirely: light parts might become dark, a clear blue reflection in the water suddenly looks brown. But I have to say it again: don’t worry too much. Enjoy the process and try to learn from the influence that nature will have on your painting. Below, you’ll see what I have created during my first plein air adventure. 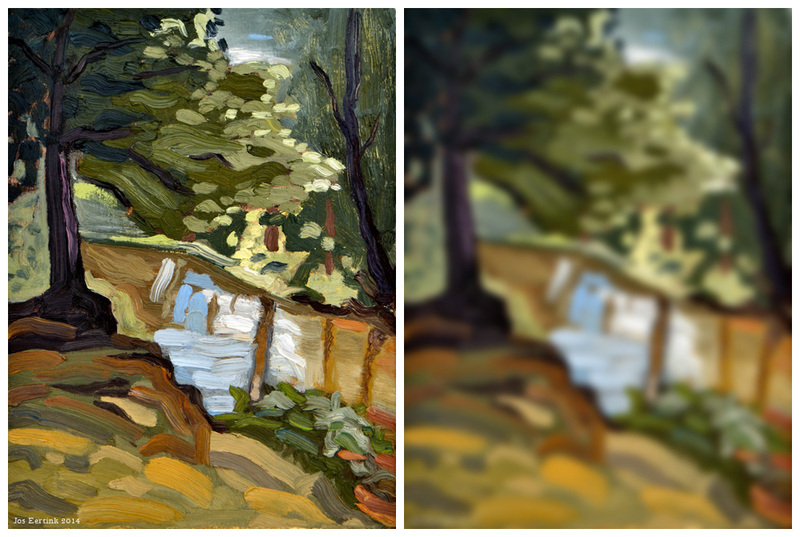 In Photoshop, I used the gaussian blur effect on my painting (the image on the right; see how the big tree works as a repoussoir). That way, you can understand better what I saw when I was painting. You can see the different shapes and natural effects I saw. Painting plein air forced me to exaggerate my rough style. What will it do with you?